Something Southern Pottery is known throughout the southeastern United States for its exceptional high quality pottery. In fact, owners Fred & Laura Ellis were featured with their work on the cover page of the guide to the highly popular Prater's Mill Festival of Dalton, Georgia on May 2002. Click here to see it. 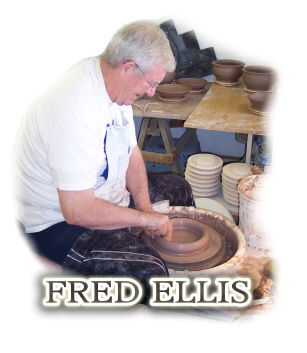 The craftsmanship and artistic ability of Fred and Laura Ellis is second to none in pure southern pottery. Their hand-fashioned pottery is created in the tradition of excellence found uniquely in the south. Fred wheel-thrown functional pottery and Laura's artistic embellishment and glaze consistently thrills pottery admirers with their attention to high quality and detail. "Y'all come on in and sit a spell!" is the greeting of most folks across the south. Something Southern Pottery is no different. We invite you to come in and visit with us a while. Look at what we have to offer you, the customer. We sell our pottery at arts and crafts shows across the Southeast. We have found that we really enjoy the connection to the folks that collect our work. It is fun to know where our pieces are going. Traveling and meeting people are almost as much fun as the making of the pottery. See you at a show soon!